Let’s say you recruit somebody to do a job for you. Because it’s a particularly dirty job, you’re having trouble finding people to fill the position…so… to sweeten the pot, you offer a $20,000 “signing bonus.” That’s in addition, of course, to the monthly salary you plan to pay them. The added incentive helps. People start signing their names on the dotted line to go to work for you. Then nine or ten years pass by. Suddenly one day you think to yourself, “Hell, what did I offer all those bonuses for? That was dumb. I think I’ll demand my money back!” Of course some of the people you paid the money to are no longer alive, and others sustained catastrophic injuries while working for you, but hey! All’s fair in love…and especially in war!!! Well, that’s the predicament that a number of US veterans now find themselves in. Back in the days when the wars in Afghanistan and Iraq were ramping up big time, military recruiters took to offering sizeable bonuses to get people to join or reenlist. Recently it was reported that the government has begun demanding this money back. Supposedly the bonuses never should have been paid out in the first place, and the decision to do so was a result of oversight, fraud, and mismanagement. So…long story short, veterans have begun paying back their bonuses, in some cases at the rate of hundreds of dollars per month, while others, those in financial binds who could not afford to meet the additional expenses, are said to be facing wage garnishment. 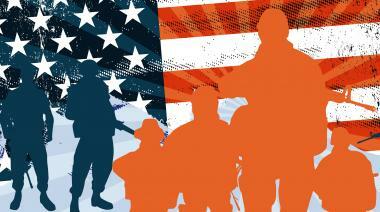 There are reports that veterans are even being charged interest on their outstanding debt. As you may expect, the story of this shabby treatment of American vets has prompted public outrage, and the latest news, posted Wednesday at NPR, is that the Pentagon is now “suspending” the debt collection program. Defense Secretary Ashton Carter is calling for “the fair and equitable treatment of our service members and the rapid resolution of these cases,” although the article seems deliberately vague and ambiguous as to whether the bonuses will have to be repaid or whether the debts will be cancelled. The only thing stated clearly is that Carter intends to establish “a streamlined, centralized process that ensures the fair and equitable treatment of our service members and the rapid resolution of these cases.” The “resolution” (whatever that means) of “these cases” is to be completed by no later than July 1, 2017, the Defense Secretary has announced. Right now the focal point of the scandal is California, because that’s where most of the illegal bonuses were paid, although it seems veterans in other states may be facing similar demands. Carter’s statement on the matter addresses only the problem in California. In 2006, at the height of the wars in Iraq and Afghanistan, the California National Guard offered bonuses for troops enlisting and re-enlisting. It was part of an aggressive recruitment effort to retain troops during the height of both of those wars. Now, ten years later, the Pentagon is demanding many of those who received bonuses – almost ten thousand service members – pay them back because they were offered in violation of Federal law. Right now, veterans are receiving letters from debt collectors, they’re being threatened with tax liens, tax return withholdings and other penalties if they do not repay those bonuses. These troops, many of them whom went on to serve overseas, were offered these bonuses in good faith and should not be penalized for what amounts to a bureaucratic failure in oversight. Congress, or the Pentagon need to make this right, and they need to do it immediately. Sign our petition calling for immediate Congressional action, or action from the Defense Department, to use its authority to waive repayment of enlistment or re-enlisted bonuses they accepted in good faith ten years ago. Congress, or the Department of Defense, must take action immediately to make things right for Christopher, and thousands of veterans like him, who are being forced into an impossible situation because of mistakes they did not make. We’re hopeful that there will be resolution on this issue, quickly, and we know that outcome is more likely if we all make our voices heard today. I have worked in financial management at the base level and at the Pentagon. In my view, there is no more important task an agency has than to alleviate any issues related to the undue financial burden placed on these veterans and their families. Aid to the Jewish state is of course vigorously pushed by the pro-Israel lobby in Washington. And the lobby, as many of us are aware, doesn’t just clamor for aid; it also promotes wars. It’s interesting that many military veterans now being called upon to repay their signing bonuses are veterans of the Iraq war. In the following video, dating from 2002, you’ll see none other than Israeli Prime Minister Benjamin Netanyahu making a case for military action against Iraq, urging the US to wage “preemptive war”–he actually uses that term, not once but repeatedly–and in the process claiming, falsely, that Saddam Hussein had chemical and biological weapons and was on the verge of acquiring nuclear weapons. Basically, he plays Congress like a violin. As you watch his performance, a performance that seems almost choreographed, consider what we now know about 9/11, the overwhelming evidence of controlled demolition, and of how the fall of Saddam Hussein led to the rise of ISIS. It’s interesting to note what was going on in 2002 when Netanyahu made that appearance before Congress. This was two years after the start of the second Intifada, and Saddam Hussein had begun paying out sums of money, in some cases $25,000, to the families of Palestinian suicide bombers. That’s a fact of history, though not a well-known one. And while Saddam Hussein posed no threat to the US, quite obviously Israel had plenty of reason for wanting him overthrown. And so Netanyahu made his pitch before Congress. And neocon pundits in the media began fanning the flames of war. Weapons of mass destruction! Mushroom clouds! Smoking guns! Yellowcake uranium from Niger! And off we went to war!! A war essentially for Israel. By 2005 we were caught in a quagmire with no end in sight, and the Pentagon, having trouble meeting enlistment quotas, began sweetening the pot with signing bonuses. Between 2000 and 2008, the money spent on enlistment bonuses rose from $891 million to $1.4 billion. The following is an article from CBS News published back in 2007. You might find it interesting. Twenty-nine-year-old Joan Marte thinks now is the right time to join the army. “I get to travel, basic training sounds like fun,” he says. Yemin Ko, 24, who describes himself as a patriot, is also signing up. “I wanted to do something important,” he says. The Army needs them both to meet its enlistment goals for this year. It surpassed its July recruitment targets by more than 200 new soldiers, CBS News correspondent Michelle Miller reports, by adding recruiters — and with an unprecedented incentive: $20,000 signing bonus given to soldiers willing to ship out to basic training within a month. “The intent of the bonus is to get folks to ship quickly so they can attend basic training and we can meet the end strength the army is required to have,” says Lt. Col. Joseph Feliciano. In New York, recruitment commanders say they’re already seeing better numbers this month since the signing bonuses were put on the table. And the army hopes to pump up those numbers by September 30th, the end of the fiscal year. “Is this what we really want? To bribe people to get them to go and fight an unpopular war?” says Larry Korb, who served as assistant secretary of defense in the Reagan Administration. Korb, who is a senior fellow at the Center for American Progress, says the new policy will be bad for the army. “They’ve already lowered the standards. Last year, when they did meet their recruiting goals, they had lowered the educational and aptitude standards,” says Korb. Under the new deal, recruits could be serving in a combat zone within four months. “That’s a risk I’m willing to take, and I’m proud of it,” says Ko. That was in 2007. Now here we are nine years later, and veterans are being told to repay the money they were paid. One such veteran is Susan Haley, who got sent to Afghanistan in 2008 and is now trying to repay the bonus she received. She presently sends the Pentagon $650 per month–a quarter of her family’s income. Haley, 47, spent 26 years in the Army along with her husband and oldest son, a medic who lost his leg in Afghanistan. There is a lot of outrage felt in America now toward our own government, and certainly a lot of it is justified. But maybe Americans, particularly those whose passions have been aroused over the treatment of veterans, should start considering the enormous influence exerted by the Israeli lobby in Washington, along with the possibility that the anger they’re now reserving for their own government is, at least in part, misdirected. It seems that Israelis are rather remarkably blessed with good fortune these days. Within a month of each other, two amazing archaeological discoveries have been uncovered in the Jewish state–not by means of an archaeological dig or excavation, but simply happened upon by chance, we are told. 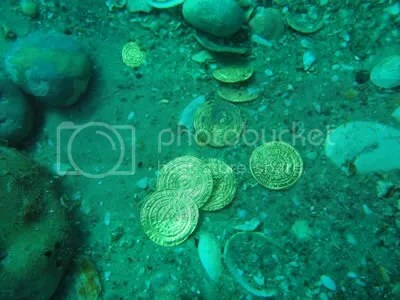 Back in February, approximately 2,000 gold coins were reportedly found by “amateur scuba divers” lying upon the ocean floor, some twelve meters deep, in the harbor of what was once the ancient port of Caesarea. In an article posted last week I discussed an exhibition of Iraqi cuneiform tablets at Israel’s Bible Lands Museum along with questions that have been raised about the provenance of the artifacts on display. The owner of the 2500-year-old tablets is an Israeli collector by the name of David Sofer, who says he purchased them in the 1990s but has reportedly refused to name the person from whom he bought them. The attacks upon the Mosul Museum and the ancient city of Nimrud, as well as the earlier ransacking and burning of documents at the Mosul library–these and other incidents like them exact a dreadful toll. They are, in essence, “taking us back to the dark ages,” as an Iraqi official recently described it. The coins from the find attributed to the divers in Caesarea are believed to be around a thousand years old and apparently are of pure gold. The discovery is described as “so valuable that it’s priceless,” and some have speculated on its possibly being the result of a ship wreck. “The coins are in an excellent state of preservation, and despite the fact they were at the bottom of the sea for about a thousand years, they did not require any cleaning or conservation intervention,” said Robert Cole, of the Israel Antiquities Authority. Israel’s shoreline is not exactly virgin territory. How did the coins manage to sit there all this time, a thousand years, in water only 12 meters deep, and not get noticed until now? The Israelis actually have an answer for that. The coins, they say, were most likely hidden beneath the sand until a winter storm shifted the seabed. “We were told [that the divers] had found about 30 or 40 coins,” says Jakob (Koby) Sharvit, director of the Marine Archaeology Unit. “Usually that means you’ve found a hoard. So we went back and performed a small excavation. After two hours, we had found something like one thousand coins. That was just for starters, though. On a second trip back to the underwater site, they purportedly found another thousand coins. At its height in the mid-tenth to mid-eleventh centuries A.D., Fatimid rule stretched across North Africa and Sicily to the Levant, with trade ties that extended all the way to China. From its capital in Cairo, the caliphate controlled access to gold from sources in West Africa to the Mediterranean, and the currency crafted from the precious metal conveyed the Fatimids’ formidable power and wealth. It may well be that the coins were discovered just as the Israelis say. Likewise the items found earlier this month in the cave. It is entirely possible, as the report on the latter discovery has it, that three spelunkers simply “wriggled through a narrow passage” at the entrance to the stalactite cave and then happened upon the stash of jewelry and coins. Certainly there have indeed been instances of archaeological discoveries made by average people who just stumbled upon them. There is the case of the Lascaux Cave in France, with its Paleolithic paintings of animals on the cave walls–discovered in 1940 by four teenagers and a dog. (H/T JS). If a portion of these looted items are finding their way into London, where else do you suppose they might be ending up? There has of course been abundant evidence of Israeli support for terrorist rebels in Syria (see here, here, here, here, here, here, and here, for instance) and it has been noted that neither ISIS nor Al-Nusra have launched attacks against Israel, even though the latter, in particular, seems to be active in the Golan Heights very close to Israel’s border. And not only do Israel and Al-Nusra not attack each other, but Israel has even transported wounded terrorists across the border for medical treatment in Israel. Most people seem to be of the opinion that the Jewish state’s motivation in all this is its desire for regime change in Syria, but are there perhaps are a few lesser-discussed fringe benefits as well? Interviewed in the video below is the highly respected Dr. Maamoun Abdulkarim, head of Syria’s Directorate-General of Antiquities and Museums (DGAM), who discusses the trafficking in stolen artifacts. The danger threatening archaeological sites in Syria is increasing because of the absence of the government institutions concerned and the archaeological authorities in certain areas. Several archaeological sites have been seriously damaged by illegal excavations, some of which were carried out by armed gangs, particularly in areas near borders or where violent conflicts have occurred. The sites of Deir ez-Zor, Mari, Dura Europos, Halbia, Buseira, Tell Sheikh Hamad and Tell es-Sin have all been damaged by thieves who excavate for objects which are sold to local and foreign dealers. Many violations that have damaged the archaeological levels at Tell al-Bay’ah and other neighboring tell sites at Raqqa have been recorded. The site of Ebla has been subject to illegal excavation for some time, causing the destruction of some parts of the site. Efforts made by members of the local community have succeeded in controlling the situation temporarily, but it has been observed that illegal excavation has taken place during the past month. Some sites in the Idlib region, within the area of the Dead Cities, which are inscribed on the World Heritage List (Gebel al-Aala, Gebel al-Woastani and Gebel Barisha) have been subject to destruction and serious damage, in particular some of the unique churches. Information has been received that illegal excavations are being carried out at these churches by gangs of thieves coming from Turkey. Kafr Oqab, according to our information, is the most damaged site in the region. The site of Apamea is considered to be one of the sites most affected as a result of the ongoing pillage at the site, which has occurred in the eastern, northeastern and western sectors of the city. A comparison between two photos taken by satellite, the first taken before the beginning of the crisis in Syria and the second on April 4, 2012, shows the extent of looting and destruction at the site of Apamea due to illegal excavation. Illegal excavation has become very common in the city of Daraa with hundreds of hired men and armed antiquities thieves taking part in excavations inside the al-Omari Mosque and at the archaeological sites along Wadi al-Yarmouk and at Tell al-Ash’ari, which will cause irreparable damage if continued. Large areas of Tell Qaramel near Aleppo were destroyed by means of heavy machinery; other sites in this region are permanently damaged. Reports from the antiquities departments of some governorates warn against the expansion of the destruction zone engineered by organized armed gangs at the sites mentioned above, especially during the past three months. This destruction affects sites that are highly significant in the history of Syria, and demonstrates that tragically, some components of Syria’s archaeological heritage are lost forever. Keep in mind that the thefts and damage itemized by Dr. Abdulkarim above are only those which occurred through 2013. Due to the events that occurred in the city of Raqqa and the absence of governmental and cultural institutions, robbers seized six boxes stored in the Raqqa Museum’s warehouse which contained archaeological objects. Previously, an armed group moved three boxes containing artifacts which belong to the National Museum to an unknown location under the pretext of protecting them. Efforts made by the officials of the department have not so far been successful in implementing the return of these boxes. In some cases looted museum pieces have been recovered, though in others, as indicated, the stolen artifacts remain missing. A visit to the DGAM website provides us with additional information. One of the more important archaeological sites in Syria is Dura Europos, a former Roman colony located in the eastern part of the country, less than 50 miles from the Iraqi border. The city was founded in 303 BC by the Seleucids, the successors to Alexander the Great, and during the Roman period it became a fairly cosmopolitan city, inhabited by Pagans, Christians, and Jews alike. In December of 2014 DGAM posted “before” and “after” photos showing illegal excavations at the site. Other photos posted by DGAM, also in December of 2014, document illegal excavations–said to be taking place on a “massive scale”–at Rahbaa Castle, in Mayadin, a short distance to the northwest from Dura Europos. Below are a couple of the photos. You can see more here. People all over the world have expressed outrage at the destruction of antiquities in the Middle East, particularly over recent depredations in Iraq, where one incident, the destruction of artifacts at the Mosul Museum, was videotaped and posted online. But none of this seems to have dampened the jubilation felt in Israel over the discovery of the gold coins. Kobi Sharvit, head of the Israel Antiquities Authorities’ Marine Archaeology Unit, heaped praise upon the scuba divers. “These divers are model citizens. They discovered the gold and have a heart of gold that loves the country and its history,” he said. While evidence of Israel’s support for terrorist rebels seems pretty substantial, it’s unclear to what extent Israelis can be held responsible for the wanton destruction occurring at archaeological sites and museums. I suppose it largely depends on whether you think the antiquities are being destroyed for religious reasons or political ones. In other offices, all the high-tech and electronic equipment had been wrecked or had vanished – computers, photocopiers, cameras, scanners, hard disks, editing equipment worth thousands of dollars, television sets. The broadcast antenna on top of the building was destroyed. Telephone sets vanished. A collection of Palestinian art objects (mostly hand embroideries) disappeared. Perhaps it was buried under the piles of documents and furniture, perhaps it had been spirited away. Furniture was dragged from place to place, broken by soldiers, piled up. Gas stoves for heating were overturned and thrown on heaps of scattered papers, discarded books, broken diskettes and discs and smashed windowpanes. In the department for the encouragement of children’s art, the soldiers had dirtied all the walls with gouache paints they found there and destroyed the children’s paintings that hung there. In every room of the various departments – literature, film, culture for children and youth books, discs, pamphlets and documents were piled up, soiled with urine and excrement. There are two toilets on every floor, but the soldiers urinated and defecated everywhere else in the building, in several rooms of which they had lived for about a month. They did their business on the floors, in emptied flowerpots, even in drawers they had pulled out of desks. They defecated into plastic bags, and these were scattered in several places. Some of them had burst. Someone even managed to defecate into a photocopier. The soldiers urinated into empty mineral water bottles. These were scattered by the dozen in all the rooms of the building, in cardboard boxes, among the piles of rubbish and rubble, on desks, under desks, next to the furniture the solders had smashed, among the children’s books that had been thrown down. Some of the bottles had opened and the yellow liquid had spilled and left its stain. It was especially difficult to enter two floors of the building because of the pungent stench of feces and urine. Soiled toilet paper was also scattered everywhere. In some of the rooms, not far from the heaps of feces and the toilet paper, remains of rotting food were scattered. In one corner, in the room in which someone had defecated into a drawer, full cartons of fruits and vegetables had been left behind. The toilets were left overflowing with bottles filled with urine, feces and toilet paper. In terms of its wantonness, the wave of vandalism and destruction being carried out now by ISIS in Iraq and Syria seems similar to a degree to that described in the quoted section above, although perhaps without the defecation. And in addition, according to a report here, Israelis also attacked the Museum of Solidarity with Palestine in Beirut in 1982–while other artists in Lebanon suffered more recent losses of their works–in the war of 2006. So it seems that an Israeli proclivity to eradicate and/or damage the cultural archives of other people has, at least in the past, manifested itself. And of course if we go by the Oded Yinon plan, the destabilization and splintering of other countries in the Middle East has been an Israeli policy since at least the 1980s. Many may remember that the destruction of cultural heritage sites in Iraq today has its historical precedent in the looting of the Baghdad Museum in 2003, and it behooves us to recall that twelve years ago US forces stood idly by as that looting took place. Likewise America doesn’t seem to be exerting a great deal of effort to stop the destruction by ISIS going on currently. Preserving archaeological artifacts was very much a low priority for Donald Rumsfeld in 2003–just as it seems to be a low priority for Gen. Martin Dempsey today–and in fact, a comparison of quotes from the two men is instructive. “Stuff happens! And it’s untidy, and freedom’s untidy,” said Rumsfeld. The Islamic State’s destruction of cultural antiquities in Iraq has stepped up a notch recently, with members of the extremist group both bulldozing the 3,000-year-old Nimrud archaeological site near Mosul and ransackingthe similarly ancient ruins of Hatra in the past few days. “All the other things we’re being asked to do on behalf of Iraq,” presumably includes training “moderate” rebels, though who these “moderates” are actually being trained to fight, ISIS or the Syrian government, remains unclear. This is, by the way, the same Martin Dempsey who claims that Israel “went to extraordinary lengths” to limit civilian casualties in its Gaza attack last summer. As Israel’s chief enabler, the US has a primary moral responsibility to do everything possible to halt the destruction of antiquities. It also has a moral responsibility to stop ISIS, though the best way to go about this is not by putting American “boots” on the ground. The Syrian Army is the best-trained and most highly motivated fighting force in the Middle East today. They are highly motivated because it is their own land and their own people that they are defending–and they, as well as their Hezbollah and Iranian allies, are deadly serious about stopping ISIS. If the US truly seeks to defeat the Islamic State, these are the forces it needs to be supporting. But of course Israel wants the government of Bashar Assad overthrown, and Syria and Iraq split into pieces, so an alliance of this sort doesn’t appear likely. And for the same reason, attacks upon antiquities will probably continue as well. The question is, how many of these antiquities will surface later in Israel?